An executive of a shoe company becomes a victim of extortion when his chauffeur's son is kidnapped and held for ransom. Slow pace in the most part of the movie. best movie i've ever seen. This is a tender, generous movie that likes its characters and presents them as real people, full of flaws and strengths. Tells a fascinating and unsettling true story, and does so well, without pretending to have all the answers. Up till now I've only seen Toshiro Mifune in Kurosawa's samurai movies, so it was kind of comical to see and hear him in this film when he stated "Shoes are my life". It just struck me as rather funny, but then, almost on a dime, Mifune's character Kingo Gondo reacted to his young son playing cowboys with a friend by stating that in a tense situation, "Man must kill or be killed". That had to be a subliminal rationale for Gondo's decision to wrest control of his National Shoe Company away from the owner and executive board. Borrowing against everything he owned, he was about to make a business deal that would have set him up for life.The first half of this movie sets up a moral dilemma for Gondo after a kidnapping gone awry puts him in the position of having to come up with a thirty million yen ransom, not for his own son, but for the son of his chauffeur. Without having knowledge of the Japanese mindset, I had trouble understanding why Gondo would have refused to pay the ransom if it meant his son's friend might be faced with death at the hands of a maniacal kidnapper. Granted, we had insight on the strings Gondo had to pull in order to put together the takeover plan for his company, but to my mind, the scales were balanced in favor of saving the kid. It was interesting to see how it was Gondo's wife and chauffeur who appealed to his better nature and not the police detectives assigned to the kidnapping case. 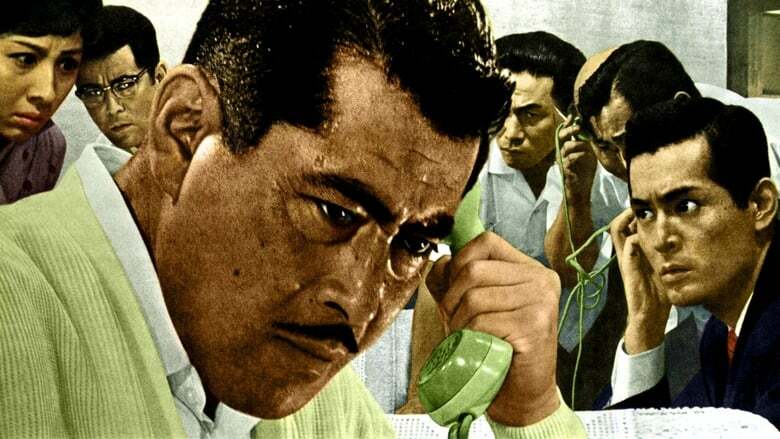 Chief Inspector Tokura (Tatsuya Nakadai) remained emotionally detached during these confrontations, which struck me as somewhat odd.What's also intriguing is how the film switches gears in the second half after the ransom demand is finally met, and the police begin their work to solve the crime and capture the kidnapper. The forensic work of the detectives is quite significant in scope, taking into account such features as train schedules, landscape, locations of phone booths near Gondo's home, and the recollections of the young kidnap victim who was released after the ransom was paid. 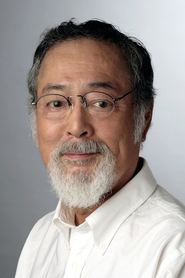 Having identified the perpetrator however, I was left stymied as to why the detective team failed to make an immediate move on Ginjiro Takeuchi (Tsutomu Yamazaki) when they had a chance more than once on the street. Since the apprehension was eventually made at a hideout location identified by Tokura, it didn't make sense to me why the police waited, other than as a concession to the script. Nothing of significance occurred with the kidnap suspect to suggest the cops should have delayed.The final sequence in which Takeuchi requested a face to face meeting with Gondo reminded me of a similar scene in the 1938 film "Angels With Dirty Faces". Only in that movie, Cagney's Rocky Sullivan went 'yellow' at the request of his childhood friend Father Jerry, whereas Takeuchi transformed from an arrogant and smug wise guy into that of a cowardly punk in the face of execution for the murder of his two associates in the kidnapping case. 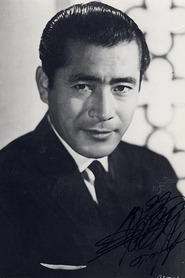 Except for Gondo appearing at the meeting with Takeuchi, the disappearance of Mifune's character in the second half of the story almost made it feel like one is watching a different movie. Viewed on DVD. 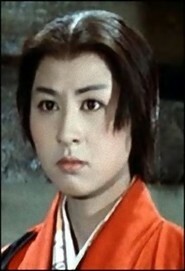 Perhaps the best in the Kurosawa canon! A close to seamless cinema/home-video experience with suspense (the nail-biting kind), intrigue (the edge-of-your-seat kind), thrills (due to an excellent script with many NON-telegraphed twists and turns), terrorism, kidnapping, restrained but none-the-less powerful acting (mostly involving the director's acting troupe), etc. The black & white cinematography in ultra wide format (at least 2.35 to 1.0) is often startling with frames always fully utilized (side to side) by the Director. The music score underlines what is on the screen without drawing unnecessary attention to itself. There are many now classic cinema scenes. Those in the police station especially stand out. Every question you may have asked yourself while watching events unfold are methodically raised, explored, and addressed with reasoned discourse (by a cast of about 20 police officers and undercover investigators). Hitchcock Japanese Style And With A Vengeance! (You might want to watch it frequently with the subtitles off to expand your formal/informal Japanese comprehension.) WILLIAM FLANIGAN, PhD. One of the all-time-great "procedurals," High and Low is a combination of immensely powerful psychodrama and exquisitely detailed police procedural - a movie that illuminates its world with a wholeness and complexity you rarely see in film. The images populate the widescreen frame like a pressure cooker that is ready to blow up. And in High and Low, blow up they do!The opening action is entirely set in Gondo's claustrophobic luxurious house, high up in the hill above the city, overlooking its industrial slums. 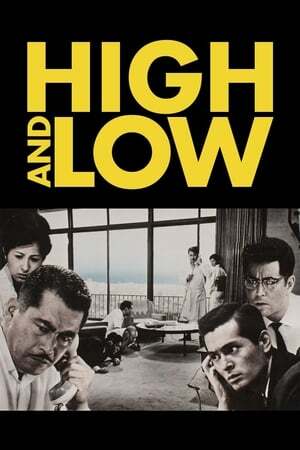 High and Low tells the story of powerhouse shoe executive Kingo Gondo (Toshirô Mifune) battling the greedy board of directors to see what direction the company is going, as he resists their scheme to make a shoddy shoe to buildup profits. On the eve of pulling off the big coup of taking over the company-a proposition that throws him in hock down to his own furniture, he's hit by a huge ransom demand, with a twist -- the kidnapper mistakenly takes, not his own son, but his chauffeur's. Paying the ransom will ruin him financially; not paying it will ruin him as a human being. As Gondo struggles with his dilemma, the movie acquires an almost allegorical profundity, while Gondo is forced to decide between the life of an innocent and fealty to an abstract code. The second half of the film changes moods considerably, as it moves outdoors into the bustling and tawdry metropolitan area and becomes a police procedural film; it becomes nail-biting as it follows through on the money exchange and the manhunt for the kidnappers. As Gondo, Mifune sheds his samurai garb to play the modern-day millionaire in a suit and tie and conveys all the terrible rage of his ambition as well as the indestructible germ of compassion that lives inside him with remarkable effortlessness. But the real hero of the movie is Akira Kurosawa, who weaves together character study, social commentary and police procedure and combines what might have been a whole series of movies for another, lesser director. Nothing compares to the experience of watching a movie where every scene, every sequence, every shot are alive with confidence in the medium. Your complaints with Kurosawa (if any) would dissolve in the backwash of pure film pleasure High and Low offers, as you're introduced once again to the master.